Husam Abdel-Qadir is making strides in breast cancer treatment. Jason Hunt is giving a clearer vision of our galaxy. Jiaying Gu is making economic behaviour more accessible. 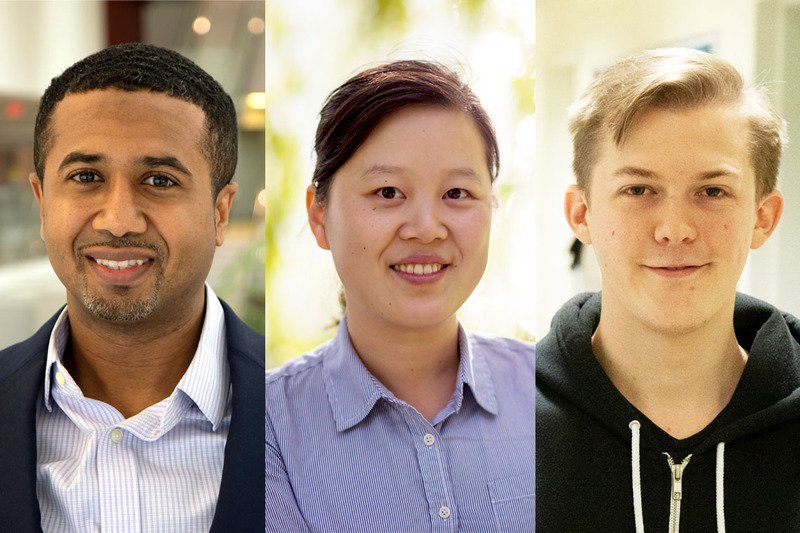 The University of Toronto researchers are among this year’s winners of the John Charles Polanyi Prize, which recognizes researchers in the early stages of their career – pursuing post-doctoral studies or having recently been appointed as faculty at an Ontario university. The $20,000 prizes, awarded by the Council of Ontario Universities, are named after U of T University Professor John Polanyi, who received the 1986 Nobel Prize in Chemistry. Of the five Polanyi Prize recipients this year, three are U of T researchers. "The University of Toronto is proud of our researchers who are being recognized for their contributions to medicine, astrophysics and economics,” said Vivek Goel, U of T's vice-president of research and innovation. Dr, Husam Abdel-Qadir, an assistant professor in U of T’s department of medicine, is being recognized for his focus on the cardiovascular health of breast cancer survivors. As a clinician-scientist at Women’s College Hospital and University Health Network, he examines the suspected link between breast cancer treatments – including chemotherapy and radiation therapy – with the development of heart diseases, including atrial fibrillation, a serious heart rhythm abnormality. “My career trajectory has involved a lot of delayed gratification,” he said, adding that he has spent almost 20 years as a postsecondary student. “I want to develop a better understanding of breast cancer patients' level of depression, anxiety and stress and I want to see how that relates to their social environment,” he said. Jiaying Gu, an assistant professor in the department of economics, was awarded the Polanyi Prize for her work that focuses on econometrics, which emphasizes the use of statistical methods in describing economic behaviour. She is seeking to understand the impact of an individual’s tastes and economic choices on the larger economic landscape. The practice of econometrics, explaining traits like heterogeneity and employing multi-linear regression models, can be dense and complicated. But Gu has been working at translating the discipline into terms that the public can easily understand – beginning in the classroom. “I do try to emphasize the kind of application, the methodology that I’m developing that can help to apply in real-life situations,” said Gu. She is using the data to better understand purchasing decisions, and describes it as "bringing the economic theory to the data." One example of her work involves teachers' performance evaluations. Teachers are often judged on student grades, but their evaluations often don't factor in individual teaching styles. By analyzing data from U.S. primary schools, she is hoping to develop a fairer method of evaluating teachers. She says the Polanyi Prize was a welcome bit of news. The core of the work of Jason Hunt, a post-doctoral researcher at the University of Toronto’s Dunlap Institute for Astronomy and Astrophysics, revolves around the structure and dynamics of the Milky Way. As part of a global consortium of researchers, Hunt uses raw data obtained from the Gaia mission, a deep space probe launched by the European Space Agency, to uncover our galaxy’s many mysteries. He received his PhD in 2015 from the Mullard Space Science Laboratory at University College in London and has been working with U of T Assistant Professor Jo Bovy since 2016. “We’re getting detailed positions and motions of about 1.5 billion stars, and this is orders of magnitude more data ­– both in terms of quality and quantity – than we’ve ever had before,” said Hunt, who began his digging with Gaia in 2013. He added that despite what we know about our home galaxy, there’s still an innumerable amount we do not, including the number of stars in the Milky Way. “It’s important for a lot of things and it’s still not super well constrained,” said the native of Devon, England. “Even Gaia, you would see only one per cent of the stars. About the Polanyi Prize, Hunt says he's "pretty proud to be within that same bracket of people, looking back over the past winners."